One of those synchronicities like Jung used to write about: I was talking with some friends on Monday night, and they referred to a movie titled "Rabbit-Proof Fence." I'd read about that fence in Jared Diamond's Collapse: How Societies Choose to Fail or Succeed. 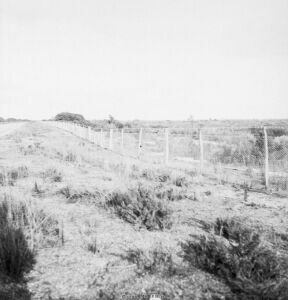 It had been constructed across the entire length of Western Australia in an attempt to control the destructive rabbit population. My friends said that wasn't what the movie was about, but the conversation jumped to something else, and nothing more was said about it. On Tuesday I decided to watch the second of two DVDs I'd rented the previous week  and it turned out to be "Rabbit-Proof Fence," which I'd picked up from reading the jacket blurb and then forgotten about, the title not ringing a bell when I heard it mentioned. It turned out that the movie was based on the real-life adventure of three girls (two sisters and a cousin) from Jigalong in the northern part of Western Australia. They were daughters of two aboriginal mothers and three different Caucasian fathers. The movie depicted what took place during 1931 when the girls were forcibly separated from their homes and taken to a camp near Perth, about 1,200 miles south. This was part of a program to integrate half-caste children into western society. The three children ran away from the settlement and headed north, hunted by an aboriginal tracker as well as the police. When someone along the way told them about the rabbit-proof fence being close by, the oldest girl knew that if they followed it, they would find their way home. After many weeks of walking, the girls heard from another person they encountered how their story was in all the papers and that one of their mothers was waiting for them at a nearby railroad station. The oldest sister intuited that the fellow was lying to them and tried to get the other girls back on their trek along the fence, but the cousin rebelled and headed for the train station. The two girls turned back for her when she didn't follow them, but before they could be reunited, they saw her picked up by a policeman at the train station. By then the youngest girl was about done in and had to be carried most of the time by the oldest girl. And their hearts dropped when the saw the fence end at a death-valley stretch of desert. But the older girl saw a "sign," found faith and told her sister that it would reappear. So they trudged on across the pathless wasteland. It struck me when I received an e-mail from a friend today, Wednesday, asking: "Is there any way to know if what you're doing is actually helping you in the search, if there is no path...." that this movie contained a good metaphor for the situation faced by the spiritual seeker. When we begin the adventure of knowing ourselves, we may start off by moving away from a way of living that we find untenable. This often involves rejection of previously-held beliefs and adjustment of habits that impede clear-headedness. Then we come across a teacher or teaching that offers specific recommendations of what to do  we find our fence to follow. We may be like the middle girl and veer off the path at some point. But if we persist long enough, we'll come to the trackless desert. To keep going toward truth (i.e., away from illusion), there's no longer a program or fence to follow. It now depends on intuition. And if we've learned to pay attention to the intuition, to the "voice of silence" coming into the mind from its source, its messages may register on our consciousness as signs. After the two girls had collapsed in the wasteland, an eagle appeared overhead, which the oldest sister recognized as a sign. There is a path that leads back to the source, the Unconditional. But, as with the aboriginal girls in the story, beyond a certain point it can only be followed by intuition and by persistent effort.